When creating a Last Will and Testament, we usually decide who will get our property – house, car, bank accounts, and clothing. On June 1, 2017, Texas passed a law specifically addressing the handling of our digital goods called The Access to Digital Assets Act. This law allows fiduciaries (designated agents or executors) to be able to easily access digital assets of a person who is incapacitated or has passed away. 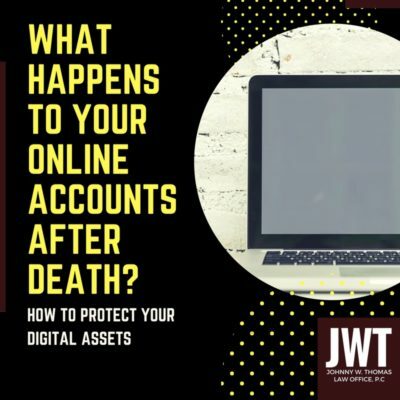 For fear of liability issues, custodians (online account companies) of digital assets have made it nearly impossible to receive the data of a person who has passed away or has become incapacitated. Not allowing third-parties such as agents or executors to access this information can lead to long periods of inactivity. And of course, long periods of inactivity make online accounts prime for hacking and identity theft issues. How do I properly plan for my digital assets? The Act provides a hierarchy when it comes to accessing digital assets. The first thing to look for are tools provided by the custodian for instances of death or incapacity. For example, Facebook has legacy settings that allow you to set your account for deletion, keep your account as a memorial, or give user permissions to a friend in the event of death or incapacity. Google accounts have an Inactivity Manager. You can ask Google to notify a designated person after a selected period of inactivity. Additionally, you can share selected data, such as calendars and emails, and data save to your Google Drive with your designated person. If the custodian fails to provide a tool, then the law looks to your estate planning documents. Both your Last Will and Testament and your Power of Attorney can include provisions allowing your executor or agent to access your digital accounts in the event you cannot. Proper estate planning with an attorney can ensure these provisions are taken care of. If there are no provisions in your estate planning documents, the law looks to the Terms of Agreement for the online account. Yes, those pesky contracts that show up in a pop-up screen before you register for a new online account have a purpose! However, many online account companies fail to provide terms in these situations or they make the process complicated, in order to avoid liability issues. Finally, if there are no user tools, no provisions in your estate planning documents, and no provisions in the Terms of Agreement for the online account, the law provides default rules. Using the tools provided by these online accounts and including the proper language in your estate planning documents can ensure your digital assets are handled in accordance with your wishes. Please speak with an estate planning attorney to ensure your digital affairs are in order.